After my Cosmo Bag tragedy, I needed a quick, "easy" project to soothe my ego. 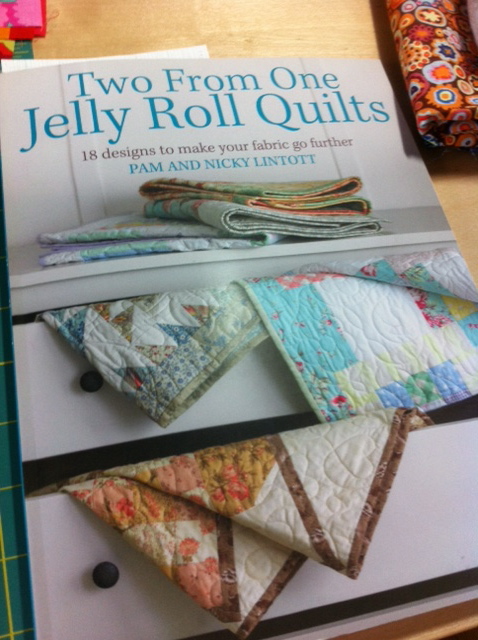 I've had this book for some time now, and decided to try to use things from my stash to make a quick, smaller sized quilt. It's interesting, you'd think that if all the quilts were made with strips, they'd all be pretty easy and not have tons of cutting, but that's just not the case. There are a few pretty complicated ones, so I went with this amended sort of rail fence pattern. Like I mentioned in my last post, I decided to use a "design roll" that I got of Kaffe Fassett fabrics. Thankfully, even though it was just 28 Strips, that was ok, because this book is about getting TWO quilts from one 40 strip jelly roll. PHEW! I tell ya', if I started another project and messed it up right out of the box, there would be some serious, sailor-like cursing going on. I haven't sewn the rows together yet, but these are the blocks. It's gonna be LOUD and sort of crazy quilt looking with all of these colors. I can't wait to get the rows done and see how they look.